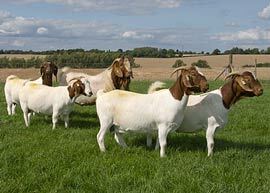 The Boer goat is a specialist meat goat that originates in South Africa, where its ability to produce excellent carcase conformation coupled with a fast growth rate has been improved over many years.UK Boers were imported from Europe in the late 1980`s, although 2000 has seen new importations from Canada and New Zealand to strengthen the genetic pool (EEC regulations do not allow direct imports from South Africa). Boers are docile by nature, despite their size and graze well. Adult bucks can reach 150 Kg., and does 100 Kg. Boer bucks can be used as terminal sires to improve meat carcases from dairy does.